I went to Trader Joe’s for groceries yesterday morning. Outside the store they had the little pumpkins I love. It seems that every year I scale back a bit on my seasonal decorating. Last year I gave much of my fall decor to my daughter. She has a large home and it looks better at her place. I’d rather buy the pumpkins and gourds when they’re in season at the grocery store and decorate around my apartment with the real thing. Then I don’t have to store anything later. In a small space home, putting out too much seasonal decor just looks cluttered. I’d rather add bits of fall to areas without having to move anything. As in the photo above. And it’s really the easiest because you don’t have to store anything at the end of the season, as the pumpkins and gourds won’t last. I added bits of fall decor to already established spaces. It’s the easiest way I’ve come up with to add seasonal decor to a small space home. I really love my white dishes. I can’t believe it took me nearly 60 years to buy a set of white dishes! They’re so versatile. And I must admit that food looks more appetizing on white dishware. My blue hutch holds my dishes. And when I get ready to sit down at the table across from the hutch, I just grab a dish or bowl or whatever from this hutch. So the dishes that are displayed aren’t just decorative. They serve a daily function. When you can mix decor and function together in a small space home, you have a win-win situation! This is the photo of Andrew from the beach. And another photo I took some time ago of red blooms I picked from the patio garden and put in this small white pitcher. I found that photo while I was digging around this past week unearthing things. I put a bit of decor over in my little office nook in my living room. That area has proved to be very handy. I can see what I have and it makes me think about projects I want to begin. If I can only find the time! Don’t you just love the stems? I like to choose the ones that have an interesting stem. I will always love bright vivid colors. But I have also come to appreciate more muted colors. They are relaxing. I like these “earthy” colors. The browns and beige and cream and white. When you add these accents, they tend to blend in rather than distract. And I love beads. I’ve been collecting them for many years. I just don’t get around to doing much with them! I have even more in the red hutch in my bedroom and probably several other places I’ve forgotten about. 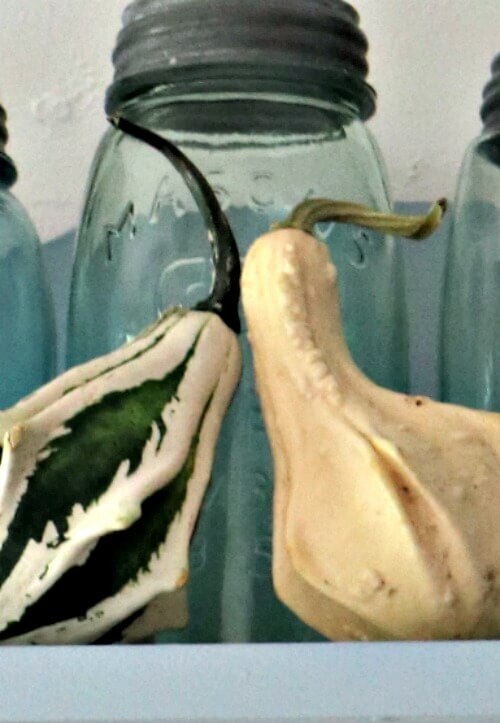 I also like the gourds that have shades of green. Green is the color of nature and you know how much I love nature! I do have a project in mind with these beads. The fall season draws me to these colors of the earth, when the leaves have fallen and the branches are stark and bare against the sky. 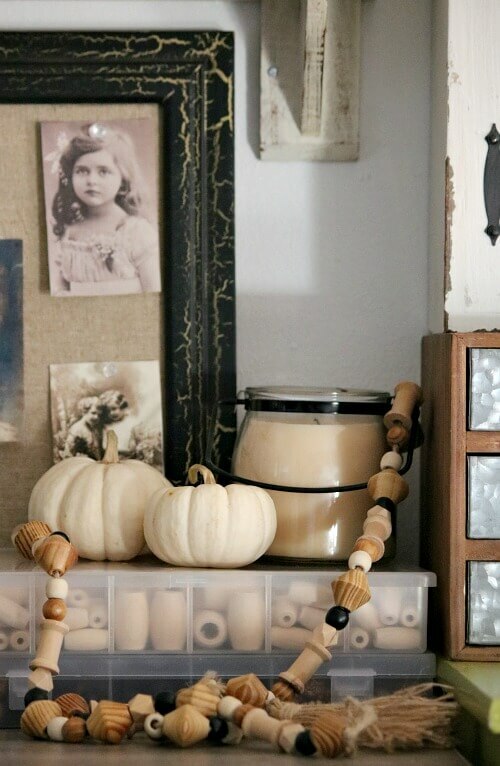 Have you done any decorating for fall? If you live in a small space, how do you decorate for the seasons? I do this, too! I also give mine a soak in a mild bleach bath. Helps them last a lot longer. Oh yeah! I’d heard you could do this. What is your mixture in terms of proportions? I haven’t done any fall decorating yet, but it’s on the agenda for this weekend! I tend to keep it fairly simple also, changing out pillow covers, maybe decorating the mantel…..a few wreaths get swapped out, fall candles brought in. I guess it’s time! 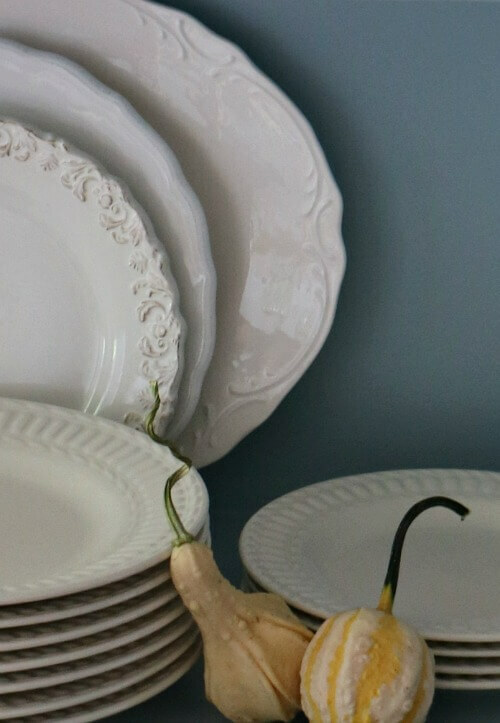 I love the white dishes – I keep thinking about buying white dishes but I have service for 16 in my set, so it would be silly to change them, unless I find a nice set at a garage sale or thrift shop. I miss having a mantle. Have fun decorating this weekend! 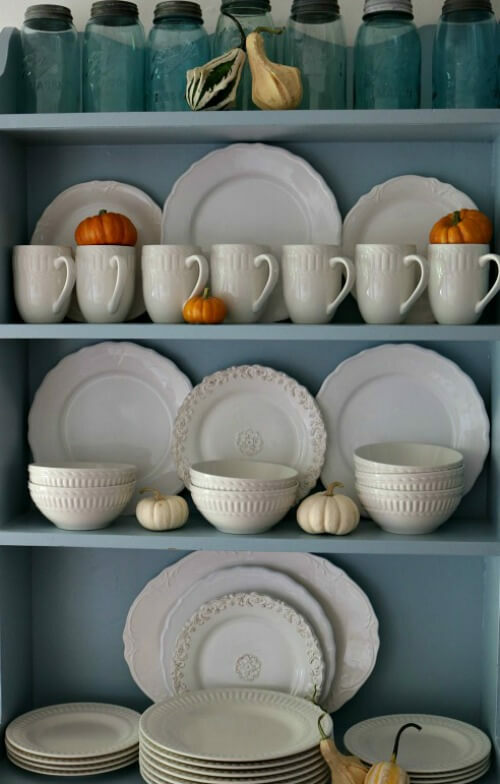 I love your fall decor and I really like the way you display your dishes. Aren’t white dishes great? They are! I can’t believe it took me so long to get white dishes. So pretty! Where did you buy your white dishes? I love your new white dishes in that pretty blue hutch! And even before we downsized, twice, I had begun to only use natural things for autumn. And now the only seasonal things I have room to store are Christmas items. Except for linens, I can always find room for vintage fall linens. 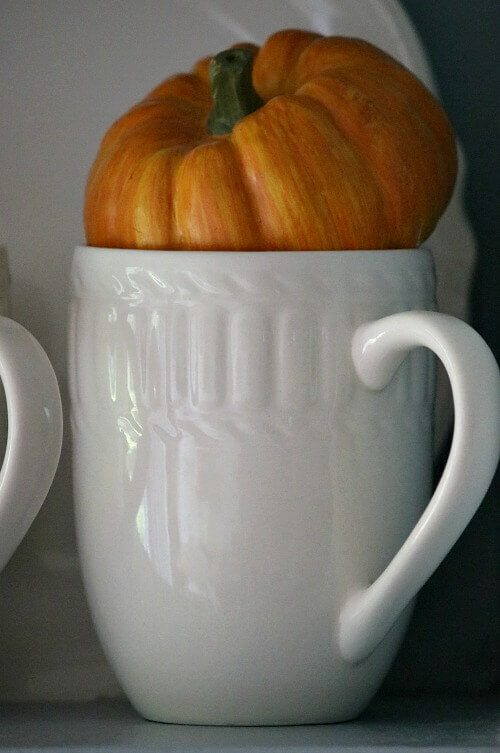 Your beautiful fall decor makes me feel chomping at the bits to shop for pumpkins too! And I also look for stems, odd shapes too. RH is very good at spotting lopsided pumpkins that I fall in love with. I hope your eyes are healing well now. Isn’t it marvelous to only have to wear readers? I’m debating not even bringing my little Christmas tree out in December. I don’t see where on earth I’d put it, and I hate taking it down and storing again. I think I might just decorate like this, natural items and a little here and there. 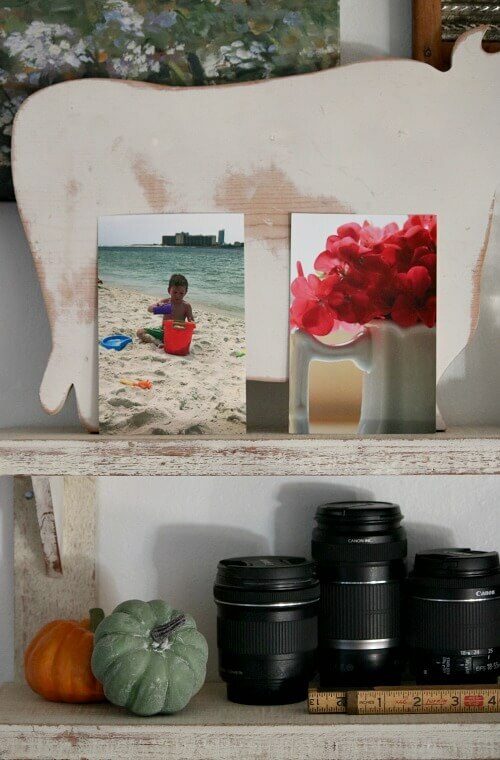 Great ideas and beautiful photos Brenda! Thank you! I truly LOVE to take photos. It looks so nice, Brenda. I really love the natural approach, seems more satisfying to me. You have such a good style. Hope little Charlie’s doing well and also that your eyes are healing. So glad that’s over for you. These things prey on one’s mind – at least they do mine. Charlie’s doing fine right now. He will end his antibiotics next week. Then we’ll see. My eyes are doing well! I love your blog and pictures so much I even go back and look at your old posts. Just today I was looking at how you decorated your mantel when you lived in the blue house. I did some fall decorating. But as I am only 5feet 2. I will have to wait for my husband to put some up on our fireplace mantel. Your craft area looks great. I know you will really enjoy that area. If you get stuck inside for winter on those days you will have an area that you can keep busy with. I was just at the craft store yesterday getting some supplies to work on things for the winter. I loved that mantel! I really miss it. I just love your decorating style and the pictures you take are wonderful! I haven’t put out any fall decor yet. Seems like I can’t get past the thinking stage. I’m inspired by your neutral decorations, all I have are orange pumpkins. I may have to get out and see what I can find along that line. I live in a small town so options are limited. But you’ve inspired me so I’ll See what I can find! I love seeing what you do! You could paint your orange pumpkins white. Love those little pumpkins and the gourds, etc. 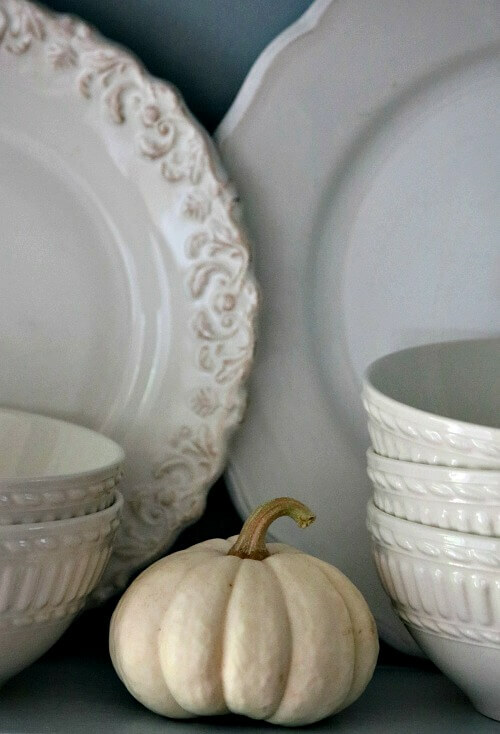 The orange pumpkins look so nice against the white dishes and against the green of the cabinet. I did go to the grocery store yesterday but did not see any pumpkins yet. Your decorations look so elegant (and so simple to copy). Hopefully, the corner market will have some this weekend. It is in the 90’s here today and I am so ready for just a hint of fall. At least placing some of these little beauties around the house will remind me that fall weather will be here before too long. Take care and have a wonderful weekend with Charlie. I’m getting more and more where I just want simple. Simple, cozy and easy. I love white dishes too. As you say the food looks better on white. Once again,Brenda,you have scored a home run! 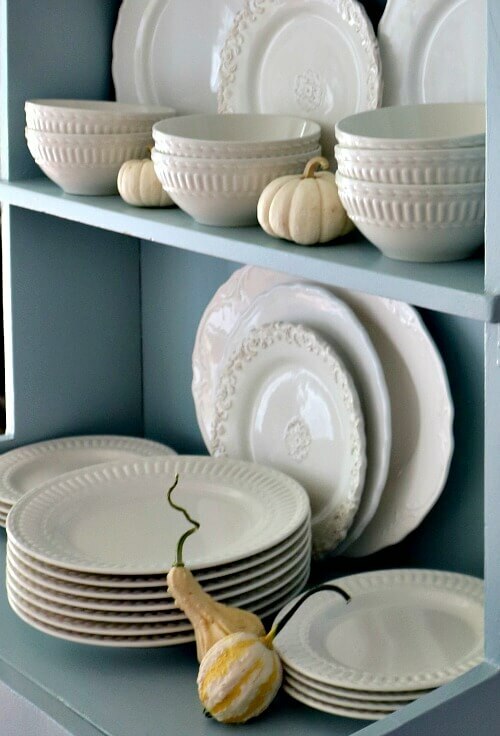 Those pumpkins are just adorable in tha t hutch against the white dishes. I am thinking I may follow your lead and keep it simple. I like everything about your decor. I look forward to reading your blog every day. I love the white dishes. I have a growing collection of white ironstone. Simplicity really appeals to me. When I was a teenager I painted my room white and had a white bedspread with a black dresser and hard wood floors. I loved it ! I ,too, go back and read your old blogs. I also go to your menu and explore the Lovely Reads , a listing of blogs you have there. 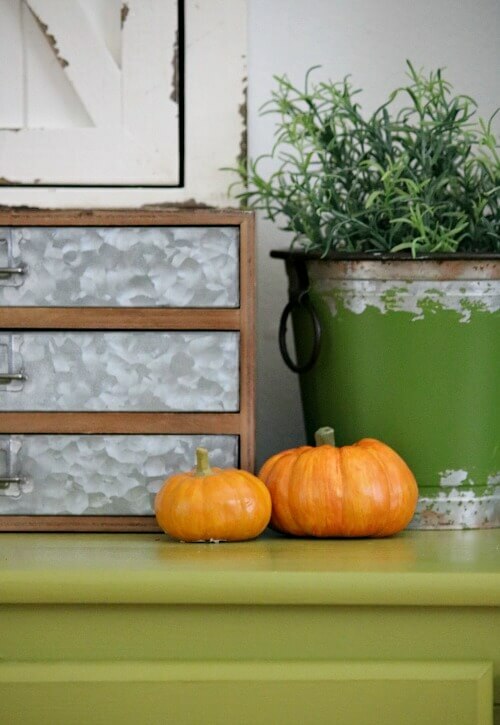 I love the little pumpkins and the natural elements you have chosen to decorate with. I went to a thrift store today to donate some cook books and while there poked around and found a copper plate for seven dollars. I thought it would look autumnal with a candle or three on it with some pine cones and acorns. I like to buy the faux candles that flicker and are battery operated as I have two cats who might be too intrigued by real flames. Love the arrangement of the blue hutch. Right now hurricane Florence is beginning to whisper in my area. I am inland in South Carolina. It’s been reduced to a category 1 storm now but expecting strong winds and rain. I’m so thankful I had my trees trimmed this spring and also had a much needed new roof put on as well. Hope everyone stays safe and dry! 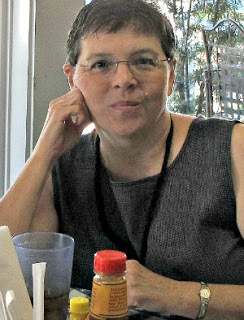 Hi Brenda. 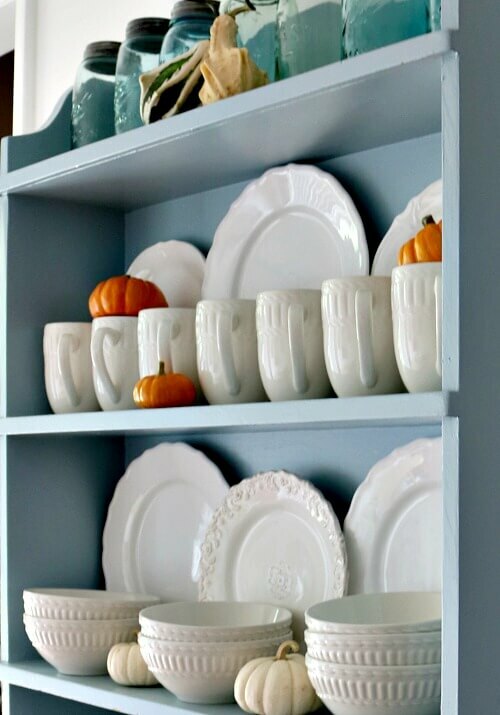 I love the color combination of the blue of the hutch with the white dishes and orange pumpkins. Just yesterday I was sorting through some little beads and made a pile of aqua, white and orange beads to use in a bracelet. 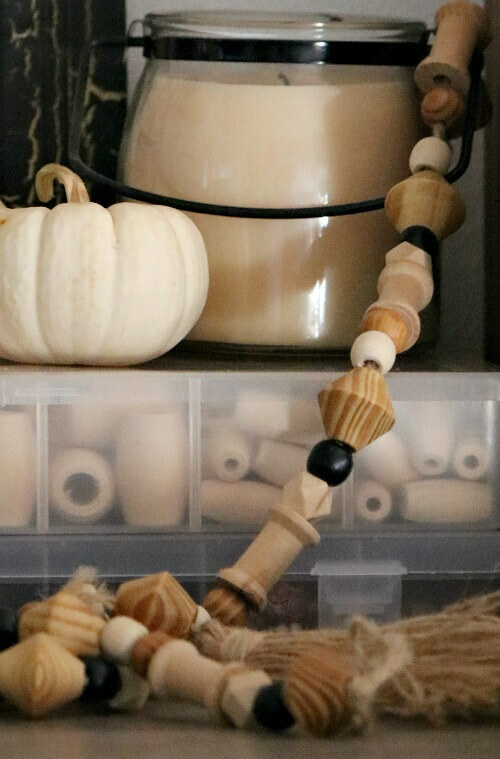 I love beads and really enjoy looking at your wooden beads. 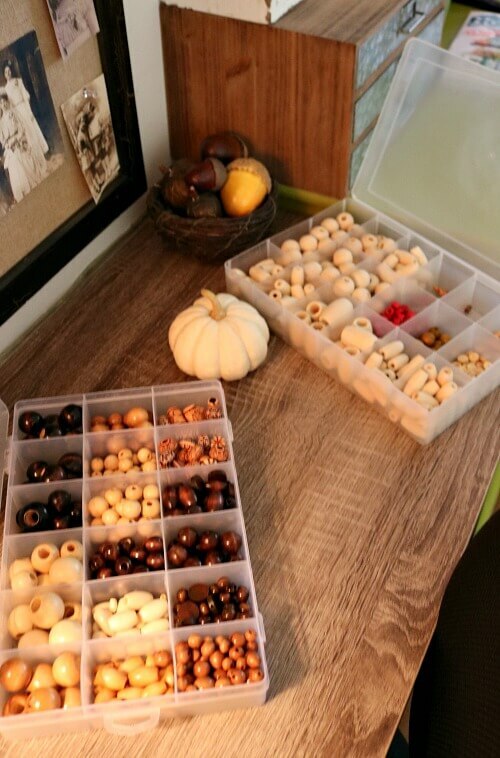 I don’t have any wooden beads so I think I will look for some because they are so nice for fall. I have made a fall decoration for the front door, and have a few decor items such as owl and squirrel figurines and orange candles in the living room. Also, dish towels in orange and brown for the kitchen. And I have a quilt in brown, orange and cream that goes on the bed as a bedspread for fall. My front door decoration, by the way, is simply a slim little cream-colored metal basket thing on a handle that hangs from a tiny nail on the red door. I just swap out the flowers and other bits and pieces in it for each season. It’s a lazy method, for sure, but, it looks nice and fits between the door and the storm door, which was a hard thing to come up with. I love the neutral touch!! I also collect beads but mine are natural rocks! So many projects to do! I love the fresh pumpkin and gourd idea. Keep it fresh and simple. Glad to hear that your eyes are healing, Charlie is almost finished with his meds and hope he is doing good!! Love what you do Brenda!! No fall decorating here for me until it’s officially fall – though I did bring out a few pieces of fall-like artwork that I seasonally rotate. That’s it for now. I love white dishes, too. I have a stack of white plates and then I have four other plates that are white with an aqua rim. They’re vintage diner plates that I absolutely love. I also have a set of white bowls, but then I have some colorful ones, too.